One of my most hidden and deepest desires as a child was to be the proud owner of a parrot. I had dreams of teaching my parrot words in other languages, singing opera to it, having it answer the phone, putting it on my shoulder and pretending like I was a pirate, etc. Subsequently, it was a harsh reality when I finally saw a real-live parrot in the home of one of my father’s friends. This African Grey knew a plethora of curse words (my mother would have to cover my ears – often seconds too late), and what it didn’t curse at me, it tried to communicate to me in Yiddish. As the parrot flung its feed and excrement from the cage onto the carpeted floor, I saw all my dreams of owning a parrot dashed. My mother is a very sanitary and hygienic person and I knew that after this display, she would never agree to such a creature in her home. This did not mean that I completely gave up on my dreams of parrot ownership. As soon as I was allowed to use the internet by myself, I would surf the web to parrots for sale in my region. Unfortunately, there always existed barriers: the sheer cost of such a bird, the fact that the parrot liked to bite people’s fingers, etc. I have digressed to mention a childhood fantasy only to introduce the country of Macau. Needless to say when I first heard the word “Macau” as a child, I naturally assumed that it was the natural habitat of “macaws” and thus became one of the places that I wanted to visit most in the world. I imagined it to be a center of brightly colored animals and wildlife – a center of fantastical sights. It turns out that Macau is considered like a fantasy world – but not for the reasons that I originally assumed. Often called the “Las Vegas of the East,” Macau has actually far exceeded Sin City. 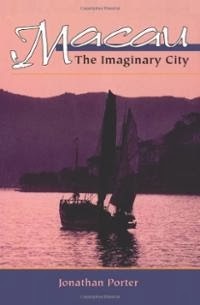 It is more than four times the size of Las Vegas and according to a recent article in The Economist, “Its casinos’ turnover last year, of $38 billion, was more than six times the Las Vegas strip’s takings.” I thus wanted to find a book that allowed me to explore the myth of Macau. When I came across Jonathan Porter’s Macau: The Imaginary City (published by Westview Press, 1996), I found the book I was looking for. Although at times, I found it a little complicated to follow (as I did not have a strong understanding of the history of Macau), it was a very pleasant read and I feel as if I gained a good understanding of an area caught between Europe and Asia. I also appreciated the extensive notes and bibliographic section. Macau found itself in the 16th century caught between two worlds: As the Chinese Empire was narrowing its focus and looking inward, Portugal began to thrust itself outward, establishing control over new regions and territories. Immediately, this put Macau at a center of globalization and “Macau’s critical role in the trade network between Japan, South China, Southeast Asia, and India, which flourished from the 1550s until the system’s collapse in the 1640s, made the city one of the wealthiest and most prosperous trading bases in Portuguese Asia.” (page 51) The system collapsed in the first half of the 1600s due to the closing of Japan to foreign trade. Following the Opium War, Britain established a colony in Hong Kong, which diminished the status of Macau as a major port. In the following years, Macau found itself establishing a unique culture as a mixture of its proximity to China and its traditional beliefs, as well as the influence of its colonizers.